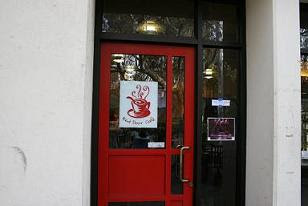 One of the most distinctly cool places on the Caltech campus is the Red Door café, which is centrally located in the student center building and what used to be the campus bookstore. The Red Doors is a great place. I love to hang out to study physics, play chess, or just science-people watch. The establishment also has some good food, pastries, espresso, and many other fine selections. There are two seating choices at the Red Door, inside the café itself and outside in a large patio area. I like both, but the choice often depends on the weather conditions. Pasadena is often sweltering hot so I opt for inside on the warmer days. The café has a number of quaint tables and a love seat in the corner. You can overhear researchers and postdocs talking about their latest experimental results. It is a great place to spread out and ponder over a new theory of quantum gravity. Outside the café you’ll find quite a few nice wooden tables with large umbrellas to shield from the elements. Although not appropriate for rainy days, on a nice warm sunny day this area can be quite exciting. You never know when a Nobel Laureate might stroll by. One day I saw famed relativist Kip Thorne sipping a drink as he conferred with a visiting speaker right after a talk at the new astrophysics building. Visiting the Red Door can be a rewarding experience to be close to curious characters as they take a break from their groundbreaking research efforts.